Shiny, uniformly black; 1 or more distal segments of antennae white, tarsi and apices of tibiae yellow; 2nd tarsomere produced into a lobe lying below the 3rd tarsomere. Body length 12-18 mm; pronotum slightly transverse, posterior margin strongly convex; elytra and wings well developed; cuticle smooth; abdomen elongated, parallel-sided, last tergite transverse, depressed between bases of branches of forceps near posterior margin, forming a semi-circular depression, at anterior border of which are usually 4 small tubercles. Forceps of 2 types: long, slender, attenuate, with a jagged dilation on the inner margin basally; or short, stout, depressed, dilated, with crenulations on inner margin basally and 2 or 3 large teeth medially. Body length 14-18 mm, foreceps 2-6 mm. Each branch of forceps slender, not broadened, and almost straight; inner margin scarcely dentated. Pygidium rectangular, sometime hidden, sometimes projecting; posterior margin concave. - Hudson, L. (1974). Dermaptera of Niue Island, and material from the Cook Islands. New Zealand Journal of Zoology, 1(1): 45-49. - Hudson, L. (1973). A systematic revision of the New Zealand Dermaptera. Journal of the Royal Society of New Zealand, 3(2): 219-254. 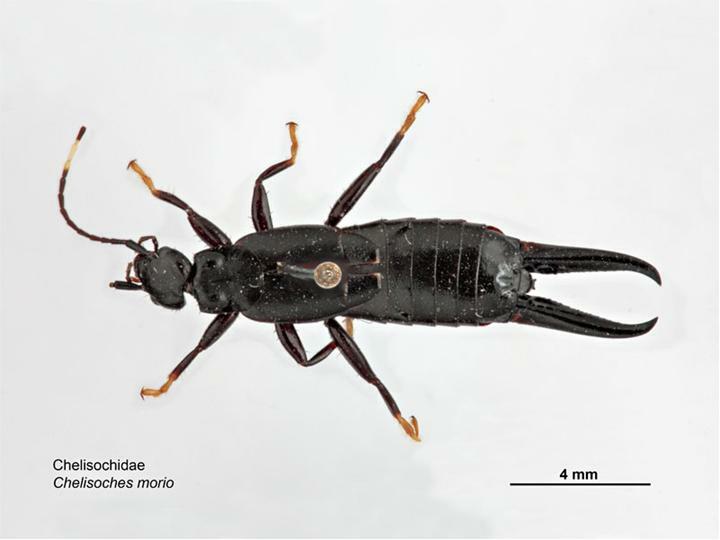 MAF Plant Health & Environment Laboratory (2010) Black Earwig (Chelisoches morio) Updated on 5/9/2014 3:49:05 AM Available online: PaDIL - http://www.padil.gov.au.